The stars have aligned, and there’s supposedly already a bidding war happening over their cosmic alliance. Emma Thompson is frequently cast as the harried yet wise yet deeply feeling romantic lead. Mindy Kaling is purportedly a big fan, putting Sense and Sensibility (perfect example) at the top of her favorite films list. The comedic characters Kaling crafts often feel like women who have been raised on rom coms, but who lack the emotional maturity to get past the shallower signposts of the genre. Maybe I’m just thinking of Kelly Kapoor, but the pairing of Thompson and Kaling makes complete sense in that context. Variety reports that the two are working on a project that has nothing to do with any of those things, a movie about a late night talk show host threatened with losing their show. 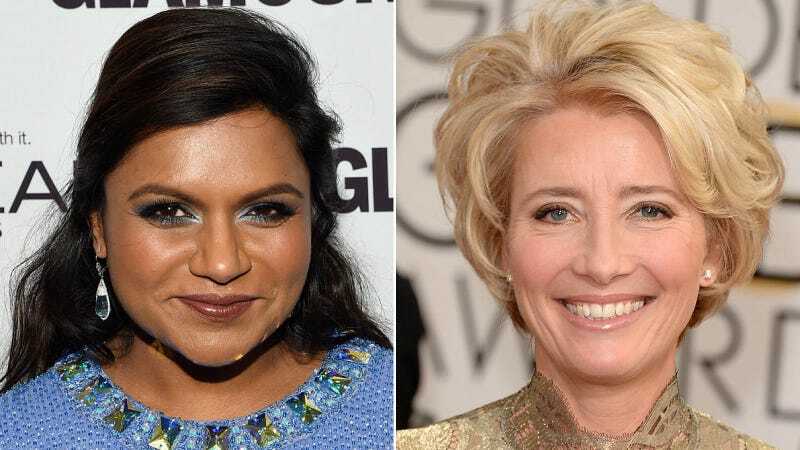 Thompson is set to play the host, who hires her first female writer, Mindy Kaling. It’s supposed to be a cross between The Devil Wears Prada and Broadcast News, but I bet Thompson will be radiating vulnerability under a seemingly fragile veneer that is ultimately unbreakable and Kaling with be the smart and femme pop culture aficionado who challenges Thompson’s comfort level with her womanhood in the sexist world of late night TV. There’s no studio or title attached to the project, but there is apparently a number of people already bidding on it. The film will be produced by Kaling, Scott Rudin and Howard Klein.